Winter is here. With temperatures reaching -7Ã‚Â°C, snow was already falling as the second annual Freshtival concluded this past Saturday. Arguably the largest pre-ski season freeskiing event, the Freshtival took place last weekend in Calgary, Alberta. Spread out over three days, the Freshtival consisted of six ski movie premieres and a rail jam packed with big-name pros as well as top locals. The scene drew a large crowd from Calgary and the surrounding areas, as well as some big names in the industryÃ¢â‚¬â€? the top pros, filmmakers and other industry players present are too many to list. All of the events for the weekend took place on campus at the Southern Alberta Institute of Technology, where a large theater and a nice slope just outside for the rail jam provided the perfect location. The Freshtival kicked off Thursday night with premieres of Teton Gravity ResearchÃ¢â‚¬â„¢s most recent film Ã¢â‚¬Å“Soul Purpose,Ã¢â‚¬? as well as Matchstick ProductionÃ¢â‚¬â„¢s Ã¢â‚¬Å“Yearbook.Ã¢â‚¬? Four films were shown Friday nightÃ¢â‚¬â€?the Ã¢â‚¬Å“After-School SpecialÃ¢â‚¬? featured the newest release from Plehouse, Ã¢â‚¬Å“Red TapeÃ¢â‚¬? as well as Jib CultureÃ¢â‚¬â„¢s first movie Ã¢â‚¬Å“Disturbing the Piste.Ã¢â‚¬? Before the final two premieres started, Tanner Hall, TJ Schiller, Mark Abma, Chris Turpin, Vincent Dorion, and other athletes signed autographs for the stoked crowd. People in the theatre and in line for an autograph were able to check out some of the DVD extras on Ã¢â‚¬Å“XÃ¢â‚¬â€?including JP AuclairÃ¢â‚¬â„¢s movie Ã¢â‚¬Å“UP1Ã¢â‚¬?Ã¢â‚¬â€?while we waited for the films to start. After more than an hour of DVD extras and autograph signing, everyone took a seat and waited for the movies to begin. The theatre was more than sold out, forcing many of the athletes and industry folk to sit in the aisles. After a brief introduction from Mike Douglas, Johnny DeCesare and Tanner Hall, the films got started. The crowd was cheering and yelling throughout the movie, it would have been hard to differentiate what, if any sections they liked best. After Ã¢â‚¬Å“XÃ¢â‚¬?, Johnny DeCesare and then Tanner Hall introduced the next movie. The audience was ecstatic throughout Ã¢â‚¬Å“WSKI 106Ã¢â‚¬?Ã¢â‚¬â€?itÃ¢â‚¬â„¢s completely different from any ski film youÃ¢â‚¬â„¢ve ever seen before, and is worth checking out for that reason alone. On Saturday the biggest event of the Freshtival, the Oakley Rail Jam, got started. The jam was didnÃ¢â‚¬â„¢t start until 3:00pm, giving riders and spectators some much-needed time to wear off their hangovers from the night before, as well as to check out the store putting this event on, Fresh Sports. This was my first time checking out the store and I was completely blown away. Wall to wall, nothing but the newest stuff from companies like Armada, Siver Cartel, 4Frnt, Line, Orage, Sessions, Helly Hansen and just about any other core skiing company you can think of. 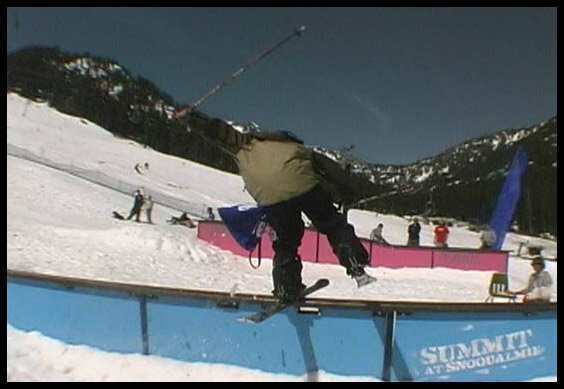 Shortly after checking out Fresh Sports, most of the athletes headed over to the rail jam and began warming up. Considering it was mid October the setup was very impressive. The course featured a scaffolding start ramp as a drop-in for the riders, followed by the choice of a flat rail or a flat-down, and ending in a small wall ride. The riders were split into two heats, with the top five skiers in each heat advancing to the finals, where $500 and other prizes were on the line. The first heat featured riders like Tanner Hall, TJ Schiller, Zach Davison, Chris Turpin and Rory Bushfield. While a few skiers tried the single kink rail, most spent their time getting technical on the flat rail with 270s on and off. Chris Turpin hardly hit the rails, skipping them to gain speed for handplant variations on the wall ride. Mike Henituik.The second heat included quite a large number of locals. Guys like Justin Dorey, Mike Henituik and Steve Hjorliefson had no problem keeping up with big names like Matt Sterbenz and Rex Thomas. In the end it would be Justin Dorey, Mike Henituk, Zach Davison, Chris Turpin, Tanner Hall, Mauro Nunez and Steve Hjorliefson in the finals. The finals were a 25-minute session where everyone threw down whatever they could. Calgary local Mike Henituk and skiing superstar Tanner Hall ultimately took home the victory with solid tricks on the flat rail and the wall ride. Mike took second for his switch on, 270 off the flat rail and flair on the wall ride, while Tanner Hall snagged first with his 270 on and numerous variations on the wall ride, including a 360 off. However, after being given his award, Tanner called Zach Davison up front and gave him an Oakley watch valued at over $500 for attempting some of the most technical tricks of the day, including a 270 on, switch-up, 270 out on the flat rail. After the rail jam most of the riders and invited guests hit the afterparty to tie up the weekend. This was without question one of the better events I have been to. Despite the 12-hour drive to and from the event, it was well worth it and I know IÃ¢â‚¬â„¢ll be back next year. ItÃ¢â‚¬â„¢s hard to find a better way to kick off the season. Tanner and Mike receive their prizes.